Our journey with alpacas began in 1984. After 30 years raising sheep and angora goats, Steven wanted to raise something less work and more fun. Alpacas were the obvious choice after seeing them when they first were imported into the United States. Rose Ann's expertise focuses on textiles and fiber, so after one touch of the exquisite alpaca fiber, it was love at first sight for her as well. As past president of the Alpaca Owners and Breeders Association (AOBA), Steven is widely regarded for his integrity and is considered a voice of experience within the alpaca industry. 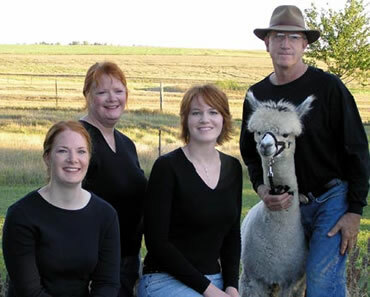 If you have questions about alpaca care, alpaca fiber or just about anything alpaca, he's got the answers. Knoblock's Prairie Ranch strives to create new levels of excellence in our breeding and fiber programs based on research and our own experiences raising several generations of fiber-producing bloodstock. We consider ourselves "Stewards of the Land," working with nature to share the beauty of alpacas, treasures of Incan times.